Retail marketers can now understand the impact of their mobile media advertising campaigns during Black Friday and other e-commerce sales — even if consumers use multiple devices before completing a purchase. 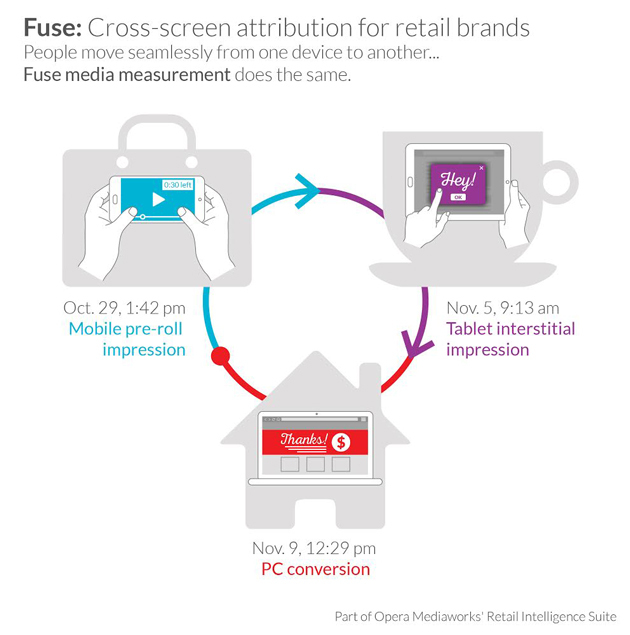 With the help of Opera Mediaworks’ cross-screen attribution system, Fuse, extending the features of its Retail Intelligence Suite, marketers can solve the problem of cross-screen sales attribution. The launch of the tool, available today, comes at a key time, as retail marketers use mobile media to drive online and in-store sales during the holiday shopping season. Consumers today are not tied to one device, but instead move seamlessly from one screen to another. Seven out of 10 American mobile users use three or more devices, and 31% of consumers switch devices when discovering, researching and purchasing products, according to Forrester. Multi-device consumers might see and interact with a rich-media ad on their smartphones, but they may not have enough time to convert and make the purchase in that moment. However, that mobile ad might have made a big impact, urging that person to search and buy later or convert to purchase when they are exposed to the brand again at a better time (e.g., on a desktop computer during a lunch break or a tablet on a Sunday afternoon). Rather than credit these conversions to the final experience only, Fuse maps multiple devices to one consumer. The goal is to understand how various mobile ads lead the customer down the path to the ultimate purchase, on another of their mobile or personal computing devices. Fuse is the latest addition to Opera Mediaworks’ Retail Intelligence Suite (RISe), which includes mobile targeting, engagement and measurement products specifically designed for retail and consumer packaged goods (CPG) brands.